Can I use Supermatic Trophy 106 mags in a Supermatic Trophy M103? If so what is the best place to get them? I know Numrich has them is there another option? Thanks, I’ll have a look. The 103 is the only High Standard I own. Bought years back with one mag. It’s the space gun. Good luck on your search. I’d look at gunbroker and eBay. Brownells has several kinds listed on there website but they are made by Triple K which have a reputation of being crap. I have at least 1 High Standard mag here, maybe a few. Let me look around. Thanks for all the info and replies. 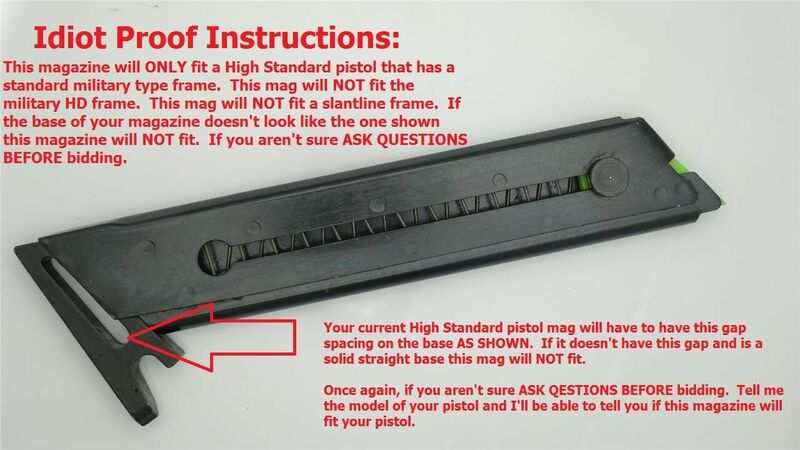 Using the idiot proof instructions and the link from jdmcomp along with my one mag I have come to the conclusion that I am in search of a standard High Standard pistol magazine, not the military model and not the Victor model. I did notice that Numrich has the Triple K brand but.... sounds like they are not highly thought of. Have not checked eBay yet. K.Funk, if you do happen to come across any please let me know. This might help but I don't really know.